Women - and female superheroes in particular - haven’t always been treated well in the world of comics. For every genuinely strong, well-rounded character, it seems like three vacuous, self-obsessed damsels-in-distress pop up and ruin any sort of progress. For years, women were largely relegated to one of three roles in comic books: the victim, the blonde bombshell, or the villain. That being said, there are a few characters who managed to transcend the litany of backwards, female-centric comic book tropes. During the Golden Age of comics, a few superheroines managed to break free of the near-universal typecasting and became something more - actual, well-developed characters with strengths, weaknesses, and personalities that extended past boys and shopping. Sure, not every character has aged particularly well, and there are still aspects of their individual stories that are clearly products of a bygone era, but the following superheroines still deserve credit for helping push the role of women in comics forward. These are the 15 First Female Comic Book Superheroes In History. Before 1940, there were no female superheroes. Women in comics were almost universally designated as one of two separate roles: a romantic interest or a supporting character. That’s not to say that all female characters prior to the ‘40s were bad - it’s just that, for the most part, they didn’t play all that big a role. Then, in Jungle Comics #2, the first true female superhero made her debut. Fantomah, Mystery Woman of the Jungle, used her supernatural powers to punish those who would threaten the jungle or its inhabitants. Transforming from a beautiful young woman into a horrifying, blue-skulled monster, Fantomah was a symbol of terror and justice... even if it meant that some of her other traits weren’t quite as well-defined as other heroes of the era. The influence that Fantomah has had on the industry cannot be understated. She is, in many ways, the template that all modern-day superheroines would draw from, and it’s easy to assume that comics simply wouldn’t have been the same without her influence. The name ‘Fantomah’ may not be all that recognizable in 2016 - but there’s no denying that, 75 years ago, artist Fletcher Hanks and his Mystery Woman of the Jungle changed the comic book industry forever. Remember how seemingly every other hero in the 1980s was some sort of barbarian or mythical warrior? Well, back in the late 1930s and ‘40s, seemingly everyone was fighting for, in or around the jungle - and the trend can be traced back to a single comic book heroine. Sheena, Queen of the Jungle made her debut in the pages of Wags #1 in 1937, and eventually went on to receive her own series a few years later. In fact, Sheena was the first female protagonist to receive her own dedicated comic book series in history - predating Wonder Woman’s debut by roughly three years. In terms of her powers and abilities, Sheena’s skills were groundbreaking back in 1937... though they probably wouldn’t turn any heads nowadays. The Queen of the Jungle was not only an expert in combat and weapons handling, but also able to speak with animals - and, as one might expect, she used these abilities to defend herself and the denizens of the jungle from all sorts of poachers and other villains. She might not technically be considered a superhero, but that didn’t stop her from becoming extremely popular back in the day. Sheena is, in many ways, a relic of her time - readers just don’t seem to care about stories in the jungle any more. That being said, her series did inspire a wealth of similar heroes, and even paved the way for a more prominent role for female heroes in comic books. Back in the mid-1940s, superhero comics were starting to lose their popularity. That might be hard to believe, especially considering how popular superheroes have become over the last decade - but, following World War II, readers simply weren’t interested in traditional superhero stories anymore. As a result, comic book publishers started to look for a way to fix their dwindling sales numbers: many turned to new genres, such as the Western, but a few companies focused more on new demographics above all else. After all, boys had always been the major target demographic for superhero comics - but young girls were, up until that point, a relatively untapped market. The Blonde Phantom was one of Timely Comics’ major attempts at creating an ongoing comic book aimed squarely at younger female readers. First debuting on the pages of All Select Comics #11 back in 1946, the Blonde Phantom wore a black domino mask, a red evening gown and a .45-caliber pistol - and, while the stories may not seem all that progressive by today’s standards, the Blonde Phantom was still a big step forward in showing that female characters could lead their own series. Surprisingly, the Blonde Phantom still pops up in Marvel’s stories from time to time: the character re-appeared as part of the Sensational She-Hulk throughout the ‘90s. Her crimefighting career may have come to a close, but that didn’t stop the Blonde Phantom from staying relevant more than forty years after her initial debut. Superhero sidekicks have been around since the earliest days of comics. Batman had Robin, Captain America had Bucky, Superman had an entire army of super-powered kids and animals - for a time, it seemed that every superhero had to have a younger version of themselves running around and stumbling into all sorts of hijinks. Golden Girl stands out from the rest of the sidekicks for being...well, a girl. That might not sound like much nowadays, but back in the ‘40s, Golden Girl really did stand out. Thankfully, the writers over at Marvel Comics ensured that Golden Girl never became a simple damsel-in-distress - Betsy Ross was a well-developed character for the times, and was more than happy to take on the Axis Powers alongside her male counterparts during World War II. During the late ‘70s, Marvel introduced a second Golden Girl - Gwenny Lou Sabuki - into the fold. Sadly, this second Golden Girl was never as popular as her earlier incarnation, and her stories were limited to a few select appearances. Even so, the Golden Age version of Golden Girl still deserves quite a bit of credit: Betsy Ross was proof that the girls could keep up with their male companions, regardless of whether or not they were simple sidekicks. As with many of the other characters of the era, Namora began her career as the gender-swapped version of an already-established character - in this case, Namor the Sub-Mariner. She mostly appeared in other characters’ comics, and was typically relegated to a supporting role - save for a short, three-issue run in her own series. What makes Namora stand apart from other, similar heroes was her standing amongst her male counterparts. Time and time again, the comics have shown that Namora was (and still is) equal in power to her more popular cousin. Even when the character first debuted in 1947, it was clear that Namora wasn’t simply a weaker, female version of a hero that already existed - Marvel Comics quickly cemented the fact that Namor and Namora were 100% equals in terms of power. Sadly, Namora’s presence in Marvel’s ongoing series has dwindled over the past several years. With characters like Namor losing steam, it only makes sense that the supporting cast would fall by the wayside as well. At the very least, when Namora does appear, the writers do a fine job of keeping her strong personality intact - but at this point, it doesn't seem like the Atlantean will be making many big appearances any time soon. Marvel is no stranger to tapping into ancient mythologies for story ideas. Namora was a part of the lost city of Atlantis, but that’s just one example - over the past several decades, it seems as if almost every Greek deity and demigod has made their way into the pages of a Marvel comic book. Venus (despite the fact that she was named for her Roman counterpart) was no exception. Though it would eventually be revealed that the character was a Siren merely posing as the goddess of love and beauty, Venus debuted as part of the traditional Greek pantheon. The earliest stories, told in the self-titled Venus magazine, started out as lighthearted affairs... though, by the magazine’s end, the stories depicted had become much darker, more mature affairs. After the magazine’s cancellation, Venus wouldn’t be seen again for the better part of two decades. Eventually, the goddess-in-disguise returned as part of Namor the Sub-Mariner’s ongoing series, where she was changed into something of a mischievous manipulator before becoming a strange hybrid of hero and victim in later years. When the original Venus was revealed to be one of the monstrous Sirens, the genuine article re-appeared - though this version of Venus demanded to be known only as Aphrodite. This version of the character was far more ruthless than the original (even going so far as to brand the false Venus for her crimes), though Marvel never established Aphrodite as a true supervillain. Essentially, Marvel somehow managed to give the same character two very different portrayals. A female comic book superheroine, wearing a black catsuit (complete with ears), fighting crime using a whip and martial arts. No, it’s not Catwoman - it’s the Black Fury! All jokes aside, it’s easy to see where Black Fury (also known as Miss Fury) had the most influence. Debuting as a Sunday strip in 1941, Black Fury laid down the foundation for smooth, sly superheroines: a tight suit, fancy gadgets and some serious martial arts training. Sure, Catwoman is the easiest comparison to make, but there are dozens of different heroes who owe their moveset and wardrobe to Black Fury. And, as with most other comic book heroes of the time, the aforementioned Black Fury is just one of several different takes on the character: throughout the years, five different publishers have released their own versions of Black/Miss Fury. Even the original character (created by artist Tarpé Mills) saw a revival via Malibu Comics throughout the ‘90s. True, Black Fury is an example of how an innovator can be overshadowed by its imitators, but that doesn’t change the fact that Mills’ Nazi-punching, crime-fighting superheroine set the standard for many modern-day heroes. For all the costumed vigilantes out there, it’s sometimes refreshing to read about a character that can get things done with their own abilities. Back in World War II, superhero comics crossed over with espionage stories on a regular basis - when Captain America wasn’t punching Hitler in the jaw, it wasn’t all that uncommon to find him sneaking into a Nazi stronghold or dealing with double agents. Of course, most people would think of Black Widow when it comes to spies in Marvel Comics - but Natasha Romanova wasn’t the publisher’s first foray into female espionage. Sun Girl, a.k.a. Mary Mitchell, was a far more down-to-earth heroine than her contemporaries. While she would regularly find herself fighting alongside heroes like the Human Torch (the original, not the Fantastic Four incarnation) and Captain America, her abilities were notably reserved: she may have been in peak physical condition, but there was nothing supernatural about her abilities. The original Sun Girl may have been a spy above all else, but a new version of the character - a young woman by the name of Selah Burke - made her debut in 2013. This version of the character, with her light-driven weapons and flight suit, is a far cry from the spy-themed escapades of the original...but it’s hard to complain when Selah’s stories are so much fun to read. Humor has always played a big part in comics. There always needs to be some sort of levity - no one wants to read a book that’s nothing but doom and gloom. That being said, titles that are solely based on comedic stories are typically few and far between: save for the seemingly immortal Archie series, few humor titles have ever penetrated mainstream pop culture...and even fewer have left behind any sort of long-lasting legacy. Millie the Model is different: not only did the series go on to become one of the most successful comedy series Marvel Comics ever published, it stayed on store shelves for nearly three decades. That’s right: the first issue was published in 1945, and the series’ final story was released in 1973. Even comic book superheroes have trouble sticking around for that long - the idea of a female-led humor series selling for 28 years was simply unheard of. Not only that, but the core Millie the Model series eventually split into a number of spin-offs throughout the years. As for the comic itself, Millie the Model tackled a number of different stories and genres over its near-30-year run. The content was typically harmless fun: aside from the strictly humorous stories, a number of adventure stories were published throughout the years. They weren’t necessarily revolutionary, but Marvel was clearly doing something right - it’s no accident that the series stuck around for as long as it did. Many consider Wonder Woman to be the first true heroine of comic books - but, in reality, Diana Prince wasn’t the first super-powered female hero on newsstands. Phantom Lady, published by Quality Comics all the way back in August of 1941, is largely credited with being the first successful superheroine in comics. The book starred Sandra Knight, wealthy daughter of a U.S. Senator, and followed her adventures as a costumed crime-fighter. With her specially-developed ‘black light’ projector, Phantom Lady was able to both render her enemies blind and herself invisible, and a car equipped with similar gadgetry was used in a number of issues. Sandra Knight was merely the first of many incarnations, however: as of now, there have been four separate heroines to adopt the name ‘Phantom Lady’ - and that’s only throughout DC Comics’ long history with the character. As the character rights bounced from publisher to publisher, several different interpretations of the character appeared and disappeared. Anyone who’s watched through the CW’s recent Arrow series will know exactly who the Black Canary is. For years, she’s been closely associated with the Green Arrow and Oliver Queen - but, as with many comic book heroines, Canary’s history is a bit more complicated than one might assume. Black Canary first made her debut in the pages of Flash Comics #86. It may seem strange to think of Canary as anything other than one of the Green Arrow’s trusted confidants, but Dinah Drake Lance first appeared alongside the infamously unpopular hero Johnny Thunder. In fact, it wasn’t until years later that Black Canary would first team up with Oliver Queen. Black Canary’s relationships get even muddier when taking the numerous DC Comics continuity reboots into consideration. When the company’s multiple universes were rebooted back in the ‘80s, Black Canary was split into two separate people: the mother-daughter duo of Dinah Drake Lance and Dinah Laurel Lance (which isn’t confusing at all). Then, when the Flashpoint storyline reset DC’s continuity yet again, Black Canary was once again a singular superheroine. Convoluted history aside, Black Canary has always done a fantastic job of showing what DC can do with its female heroes. For decades, Black Canary has been one of the publisher’s strongest characters, regardless of gender - hopefully, that won’t change anytime soon. The Fantastic Four have always been known as the First Family of Marvel, so it makes sense that Susan Storm would be the publisher’s first female character. Now, with so many comic book companies and different mergers going on throughout the ‘60s, it can be hard to draw the line as to which character belongs to which publisher. Other characters on this list technically belong to Marvel, but only because their original publisher was either bought by or absorbed into it. Marvel Comics as fans know it today began back in 1961, and kicked things off with a little book known as The Fantastic Four - and single-handedly ushered in the Silver Age of Comics. During her earliest adventures, however, Sue Storm - who was dubbed the ‘Invisible Girl’ - played more of a supporting role. She was a capable hero, that much is certain, but this was an age dominated by male heroes with incomparable strength...meaning that the Invisible Girl was at a disadvantage from the very beginning. Thankfully, things definitely got better as the years went by: Susan Storm would play a larger and larger role in both the Fantastic Four family dynamic and the Marvel Universe as a whole, and like many other female Marvel heroines, eventually grew into the character that readers know and love today. For X-Men fans, Jean Grey will always be known as the tragic wielder of the unbelievably powerful Phoenix Force - but, for a long while, Jean Grey was a far more traditional female character than one might expect. Jean Grey - known as Marvel Girl back in the ‘60s - was one of the founding members of the X-Men. All of her classic powers, such as telepathy and telekinesis, were there from the start, but her role in the group was vastly different. In the earliest days of the series, Marvel Girl was more of a romantic interest than anything else: as the girlfriend of Scott Summers, many stories essentially relegated Marvel Girl to a side character, rather than a fully fleshed-out member of the group. It wasn’t until nearly a decade later that Jean Grey finally took on a starring role. The Phoenix Saga completely changed the X-Men status quo: Jean was no longer the weakest member of the team, and became one of the Marvel Universe’s greatest and most powerful villains of all time. The Phoenix Saga was more than just a revival of Jean Grey’s character, however: it marked a turning point in Marvel’s portrayal of female heroes in general. To be fair, things weren’t (and still aren’t) perfect, but it was during the Phoenix Saga that the publisher began making huge strides in creating relatable, interesting, well-developed female characters. All things considered, fan-favorites like Squirrel Girl and Spider-Gwen probably wouldn’t exist had Jean Grey never become the Phoenix. If there’s any one character that can be credited with popularizing female superheroes in comics, it’s Wonder Woman. Diana Prince is nothing less than iconic. For the past 70+ years, Wonder Woman has proven that a superheroine can be just as popular (if not more-so) than her male peers. First appearing in 1941, Wonder Woman quickly became one of DC Comics’ greatest heroes - there’s a reason why the Amazonian is traditionally depicted alongside Batman and Superman. What’s even more impressive is how far Wonder Woman’s stories have come. To be perfectly fair, reading some of the heroine’s older stories can be tough - comics written back in the 1940s weren’t exactly progressive. Over the past several decades, however, Wonder Woman has become a symbol of female empowerment and equality: time and time again, DC has proven that a female-led comic book series can compete and even outperform stories with male heroes. And, as if that wasn’t enough, Wonder Woman was one of the first comic book heroes to make the jump into mainstream pop culture. Sure, the Adam West Batman TV show was goofy, but Lynda Carter’s portrayal of Wonder Woman is still considered to be one of the best - not only that, but many DC fans consider the upcoming Wonder Woman movie to be one of the most promising projects in the DC Cinematic Universe. True, Wonder Woman does have her shortcomings, and she’s far from a perfect character - but that’s easy to ignore when the character helped revolutionize an entire medium seemingly overnight. The original Miss America was, in a lot of ways, the quintessential World War II superheroine: she fought alongside heroes like Captain America and Bucky, battled the Axis Powers and somehow wore a skirt while fighting crime. However, her time in the spotlight was relatively short compared to most other heroes, and the character’s first run ended after just five years on the shelf. Things didn’t get any better as the years went by, as the original Miss America eventually died due to radiation poisoning during childbirth (it’s complicated) and was turned into a mindless cyborg puppet. The Miss America that most modern comic book fans will recognize is America Chavez, a young Latino LGBTQ woman who debuted back in 2011. 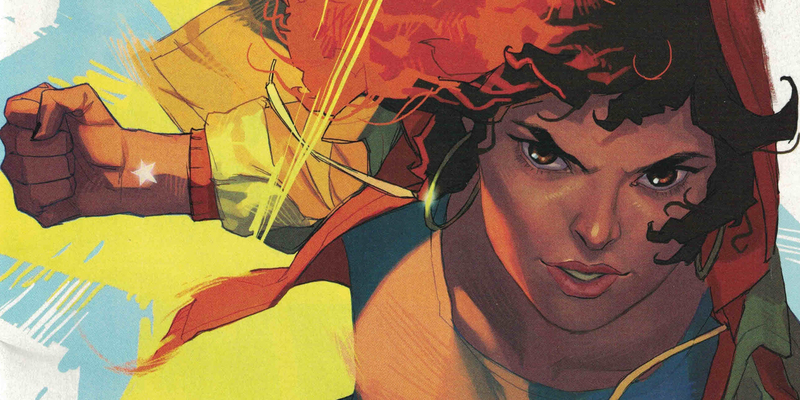 Since then, Chavez has gone on to become one of Marvel’s most popular female characters, and is cited by many as a strong example of the publisher’s efforts to create more inclusive and diverse characters over the past several years. Frankly, it’s easy to see why so many people are drawn to this new take on Miss America: whereas many classic superheroines are strong characters, few are consistently portrayed as relatable people. Chavez is a superhero, sure, but it’s clear that the writers over at Marvel also wanted her to come off like a real person with regular-people problems - it’s the same sort of writing that made characters like Spider-Man so popular, rather than the near-omnipotent demigods that dominate DC Comics’ line-up. If anything, Miss America is a fantastic example of just how far female protagonists in comics have come over the past 70 years: it's not simply about making sure there's a series designed specifically for girls, but creating characters that anyone can read about and enjoy.